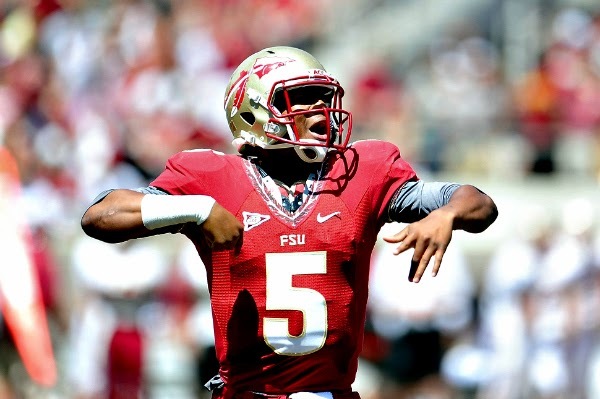 Tru School Sports: Should Jameis Winston Be Considered The Heisman Trophy Front-Runner? Should Jameis Winston Be Considered The Heisman Trophy Front-Runner? Florida State freshman quarterback Jameis Winston is having an outstanding season after redshirting last season. Winston has 2,502 passing yards, 27 total touchdowns-24 passing, and only seven interceptions thrown. (deadspin.com). Florida State freshman quarterback Jameis Winston had his first 'non-spectacular' game this season on Saturday night, but it was good enough to lead the third-ranked Seminoles to a 41-14 victory over seventh-ranked Miami. Winston has now led the undefeated, 8-0, Seminoles to three victories against teams they faced that were or are currently ranked inside the Associated Press-AP or Bowl Championship Series-BCS Standings' top 25 teams. The big question: is that enough to make him a Heisman Trophy front-runner? The Seminoles had a starting quarterback competition in the spring to try to determine who would be EJ Manuel's successor. Manuel had a very good year last season and was selected in the first round of the 2013 NFL Draft by the Buffalo Bills. Winston has shown this season, after redshirting last season, that he can do a great job at being Manuel's successor. Winston's statistics this season are 2,502 passing yards, 27 total touchdowns-24 passing, and only seven interceptions thrown. His spectacular season has led to television shows debating if he is the Heisman front-runner. A YouTube video posted on Oct. 21, showed "Numbers Never Lie" hosts, Michael Smith and Jemele Hill, using statistics to help analyze if he is a Heisman front-runner. The most interesting thing in that video is the number of AP or BCS Standings' top 25 teams Winston's Seminoles have defeated this season, three. The Seminoles defeat then 25th-ranked Maryland on Oct. 5, then third-ranked Clemson on Oct. 19, and the previously undefeated Hurricanes, seventh-ranked, on Saturday. Against the Hurricanes, Winston had 352 total yards, only one touchdown pass, and his first ever two interception game. The Hurricanes' defense had given up the seventh-fewest yards per game among Football Bowl Subdivision entering Saturday's game. In a typical year, Winston's performance this season would make him the clear Heisman Trophy front-runner. However, there are two other quarterbacks who are having phenomenal seasons. On Oct. 21, ESPN "First Take" hosts, Skip Bayless and Steven A. Smith, and Danny Kanell, an ESPN College Football Analyst, had an interesting discussion about Oregon quarterback Marcus Mariotta, Texas A&M quarterback Johnny Manziel, and Winston's Heisman Trophy chances. One of the quarterbacks, who is ranked first on the ESPN Heisman Watch, is Mariotta. The Ducks did not play a game on Saturday, but he has still been able to produce great statistics. Marriotta's statistics are 2,281 passing yards, 29 total touchdowns-20 passing, and zero interceptions thrown. This has played a huge factor in the BCS listing the undefeated, 8-0, Ducks as the second-best team. The other quarterback, who is ranked third on the ESPN Heisman Watch, who is having a great season is the incumbent Heisman Trophy winner, Manziel. Manziel had 273 passing yards, six total touchdowns-four passing, and zero interceptions in the Aggies' 57-7 Saturday night win over UTEP. This helped boost his statistics this season to 2,867 passing yards, 34 total touchdowns-26 passing, and eight interceptions thrown. The Aggies were ranked 12th in the recent BCS Standings and they currently have a 7-2 record. One loss was to top-ranked Alabama on Sept. 14 and the other loss was to then 24th-ranked Auburn on Oct. 19. The majority of Heisman Trophy winners since 2000 have played for teams who finished the season with a top 10 ranking in the final BCS Standings. Winston is ranked second on the ESPN Heisman Watch. The Seminoles are scheduled to play unranked Wake Forest, Syracuse, Idaho, and Florida. If the Seminoles are able to finish with a better conference record in the Atlantic Division of the Atlantic Coast Conference-ACC than the Tigers, Clemson, they would play the winner of the Coastal Division of the ACC. The Hurricanes are currently the Coastal Division winner. The possible rematch that could determine if Winston wins the Heisman Trophy is on Dec. 7 in Charlotte, NC.